In the first scene of my 1950s coming-of-age romance novella Tomboy, Harriet Little is at school for her first day of fourth grade. It’s 1951, and they start out the day by saying the Pledge of Allegiance. 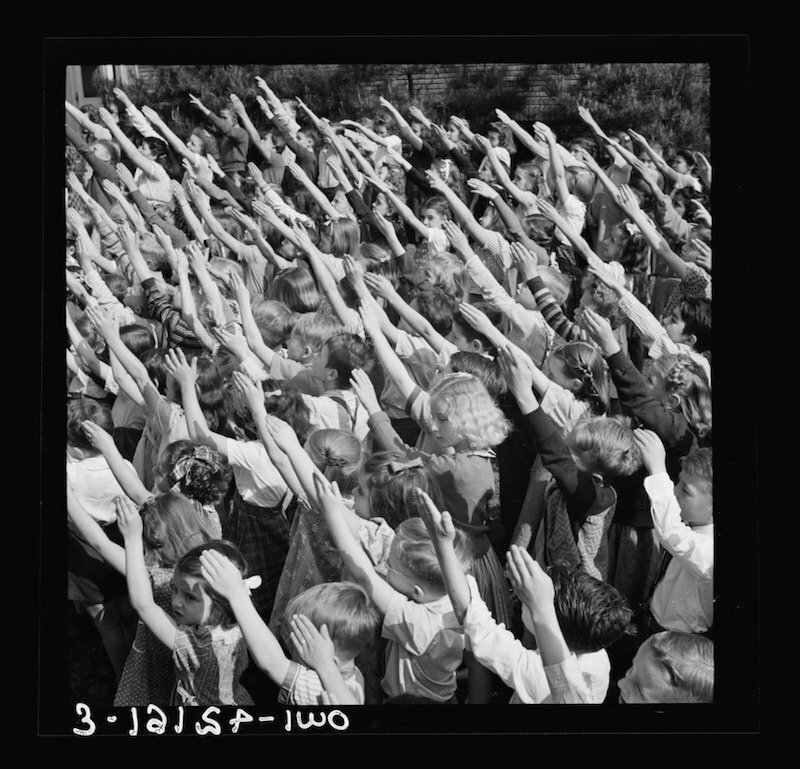 School students in Connecticut saying the Pledge of Allegiance with the Bellamy salute, May 1942. Photo is a work of the US federal government in the public domain. 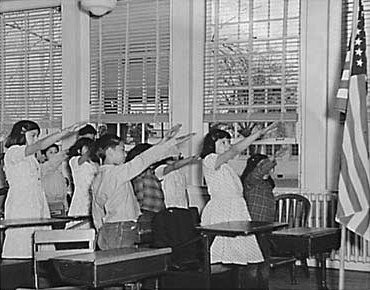 School students saying the Pledge of Allegiance with the Bellamy salute, 1941. Photo is in the public domain. 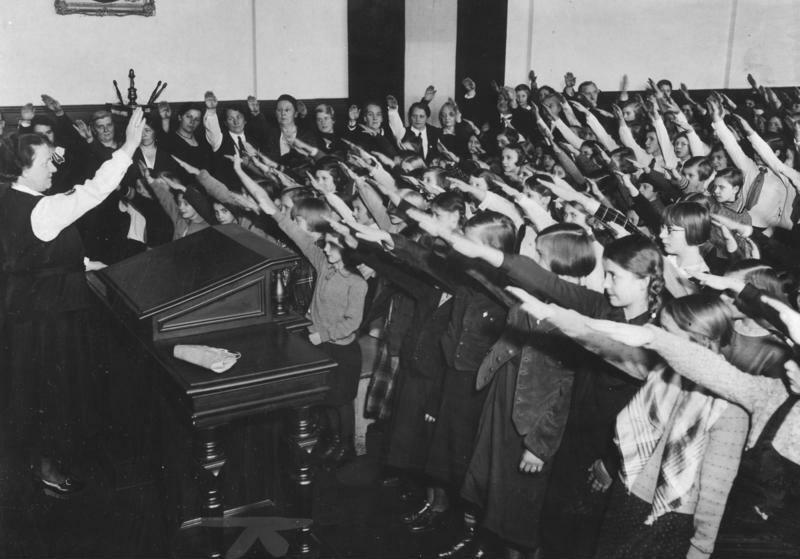 School children giving the Hitler salute in Berlin, Germany, 1934. Photo from the German Federal Archive and used through a Creative Commons 3.0 DE license. 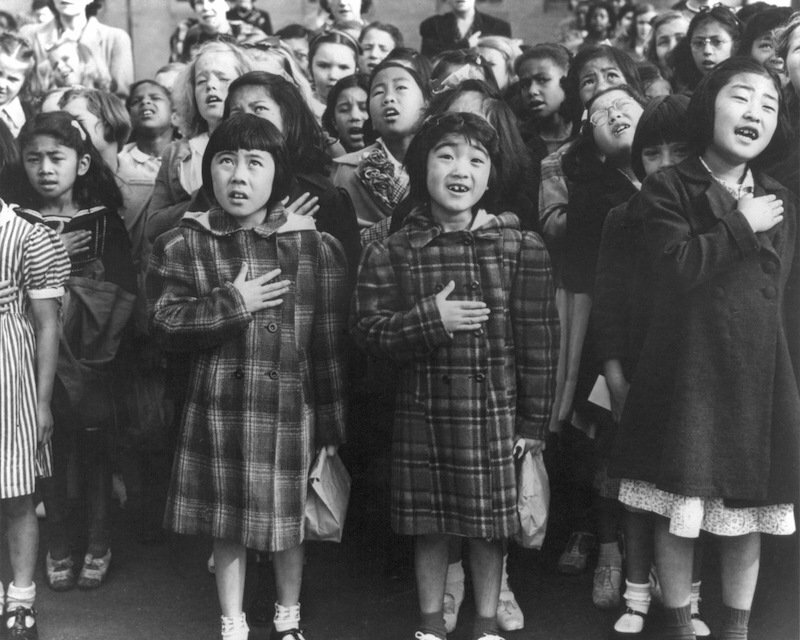 Photo of school children in San Francisco saying the Pledge of Allegiance in 1942. The children of Japanese ancestry were later moved to internment camps. Photo by Dorothea Lange and in the public domain. That posture was enshrined into U.S. law by an act of Congress in December 1942. Wikipedia has an excellent summary of Pledge salute history if you’re interested. After World War II, Nazism was replaced by communism as the largest perceived threat to American democracy. Communist partisans had gained control of the Russian government back in 1917, making it the first national government with a communist majority. Russia had a vast empire stretching east, west, and south, and most of those territories were officially incorporated in the Soviet Union in 1922. Beginning around 1940, the Soviet Union expanded its influence in much of Eastern and Central Europe, either by invasion or political maneuvering. Poland, Lithuania, Estonia, Latvia, Czechoslovakia, Hungary, Bulgaria, Albania, Romania, parts of Finland, and the eastern part of Germany quickly came under Soviet control—changes that often violated treaties made with the U.S. government. This change to the Pledge wasn’t an isolated incident. In 1956, Congress adopted “In God We Trust”—which had previously been used as an inscription on US coins at the Secretary of the Treasury’s discretion—as a new national motto to replace or be used in addition to the one that had been used for the previous 174 years: E pluribus unum (“Out of many, one”). The legislation also required “In God We Trust” to appear on all US currency. That wasn’t revolutionary as far as coins went; the Treasury had been stamping “In God We Trust” on all of them since 1938. But it was new for paper currency, which had never born the motto. The first American paper currency to read “In God We Trust” entered circulation in October 1957. As for the Pledge of Allegiance, the U.S. Supreme Court recognized in 1943 that students cannot be compelled to recite the Pledge of Allegiance, and in the 1970s the courts clarified that kids could not be compelled to stand, either. Nonetheless, news stories and court cases frequently arise after public schools punish students or intimidate them for not participating in Pledge rituals, and parents have filed a number of unsuccessful lawsuits over the use of the words “under God” in a school activity. 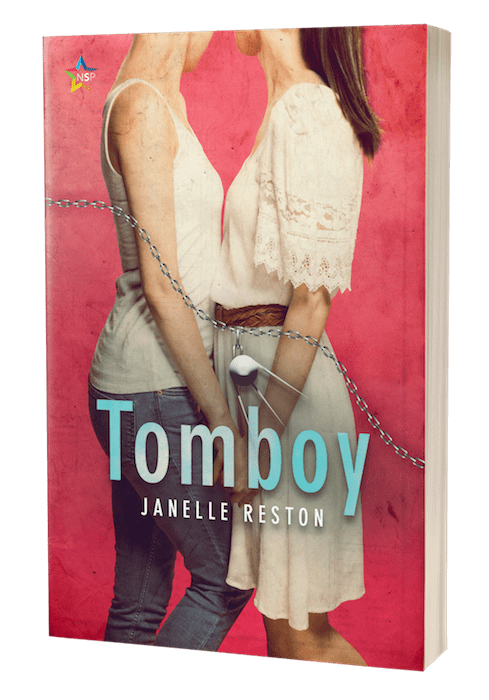 If you found this post interesting, check out my other Tomboy history posts.